Summary: Geshe Thupten Jinpa’s unique experience puts him in an excellent position to convey Buddhist philosophy in a nuanced way that will also resonate deeply for Western readers. His book, A Fearless Heart, is recommended highly. 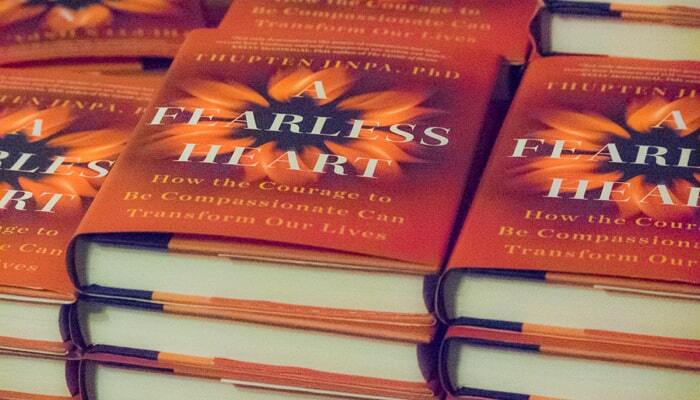 Dr. Thupten Jinpa’s new book, A Fearless Heart: How the Courage to be Compassionate Can Transform our Lives, is a very important new book. For those of you who may think you do not know who Thupten Jinpa is, you probably have met him without realizing it. He has been His Holiness, the Dalai Lama’s principle English language interpreter and translator since 1987. A former Tibetan Buddhist monk, he holds a Ph.D. from Cambridge University. He is an adjunct professor of religious studies at McGill University and chairman of the Mind and Life Institute. He is well known in Tibetan Buddhist circles; several monasteries recognized him as an incarnation of one of their great teachers but Jinpa (as he likes to be called) never took on the mantle of tulku, or incarnation lama. He is famous for his achievements in the complex form of debate that is the core form of scholarship in Tibetan Buddhist education. Jinpa is the author of many books and articles and he has translated countless scholarly texts from Tibetan to English, but this is the first time he has written a book on concepts of Tibetan Buddhism for lay people. With this book, Jinpa steps out of the relative shadow where he has remained for many Westerners. A Fearless Heart is both accessible and profound at once. This is not surprising, because this is very much how Jinpa himself is. In this book he weaves together the latest in neuroscience with personal anecdotes about his own struggles to become more a compassionate being. He outlines experiments, many of which he designed himself with the development of the Compassion Cultivation Training protocol at Stanford University over the last eight years. The results of these experiments demonstrate changes in brain chemistry in subjects who have undergone this training as they have stepped outside of a more constricted way of being and made the effort to respond more compassionately in all situations– not only with others but also with themselves. He also recounts intensely personal struggles that he and his family underwent in the wake of the Chinese occupation of Tibet, as they struggled to reconstruct their lives under very difficult conditions. He is at once personal and transpersonal in his focus. He is at once uncomplicated and complex in his approach to the human condition. The wonderful thing about this book is, like all of Jinpa’s teachings, it can be read at multiple levels at the same time. If you are having a day where things are pretty hard, and you are having a hard time maintaining a compassionate attitude toward yourself or others, you can come to this book for instruction on the particular issue that you are dealing with. Or if you are feeling a bit more expansive, you can come to this book and find a new entry into an issue that you have already been working with. One of the most helpful things about this book is that it talks about what compassion is and what compassion is not. Many of us can get stuck in our personal work, believing that we are not allowed to have a negative response to a difficult situation if we are going to be a compassionate person. Jinpa does a marvelous job steering us away from any spiritual bypass that would encourage us to simply “stuff it” while sitting on our zafus trying to meditate. He speaks extensively about moral outrage as a valid response to cruelty or injustice, while showing us how to remain in a compassionate frame of mind as we allow ourselves to explore that outrage. Self-compassion should not be confused with self-pity, either. In self-pity, we get caught up in our problems and in a feeling of being sorry for ourselves, we become oblivious to the world around us. Self-pity is a form of self-absorption, actually, while self-compassion allows us to see our difficulties within the larger context of shared human experience. Because of its narrow, zoom-lens vision, self-pity tends to blow up our situation so that even a small problem appears overwhelming and unbearable. In contrast, self-compassion affords a sense of proportion that helps us deal with our predicaments and suffering in more constructive ways. I think that Jinpa, through his extensive academic and non-academic education in the West, has come to truly understand the Western mind in ways in which many great Tibetan Buddhist wisdom holders have not been able to. In particular, he seems to have a pretty good grasp of a terrible malady that Westerners are dealing with: self-loathing. He talks about his struggle to help His Holiness the Dalai Lama understand this concept at a conference on East West Psychology where he was translating for him. When he translated the word “self-hatred,” His Holiness interrupted him multiple times telling him he must have mistranslated the word because the self cannot hate the self. Only with Jinpa’s extensive explanation could His Holiness begin to grasp the gravity of this Western experience that was so completely beyond his imagination. Jinpa’s relating of this story is an excellent example of how Jinpa not only helps Westerners digest the profound wisdom of the tradition he comes from, but how he also helps the great masters of that tradition understand the west. This book is a wonderful example of that effort in both directions. It offers Westerners insight to the Tibetan experience. It offers an understanding of how the Tibetans might view the Western condition. And through it all, Jinpa consistently provides a bridge. Some of the most important bridging he provides lies in the profound yet accessible exercises and meditations and reflections he offers his readers to help them become more compassionate beings. Through his understanding of East and West, he provides anyone from any culture – Easterners and Westerners – a practical path to the benefits the practice of compassion provides. One of my favorite stories in this book is about Jinpa’s own struggle to become more compassionate. In his characteristic generosity, he shares his personal experience again and again throughout this book. But this story strikes home in a particular way. He talks about his reluctance to interrupt his studies to visit his grandmother whom he had never met when she received an opportunity to leave Tibet. This opportunity was due to an unexpected loosening in the Chinese government’s restrictions on Tibetan citizen’s ability to travel outside Tibet. The story is much longer in the book, but I will offer you a peek here. How fortunate we all are that Jinpa has made this effort. Through him, we are able to touch a wellspring of wisdom his grandmother so effortlessly carried and apply it to our own lives.